Poggio Bonizio first becomes known towards the end of 13 C as a town at the point where the rivers Staggia and Elsa meet, on the famous via Francigena. Poggio Bonizio was destroyed in the 1270 by Guy de Montfort, a legendary figure even in Tuscany - he merits a cameo role in Boccaccio's Decameron as well as Verdi's Sicilian Vespers. The town was rebuilt in the lower valley, on the site of the village Marturi. The modern town, much damaged by bombs during the second world war. Joseph Heller's first bombing run was over Poggibonsi on 24 May, 1944. 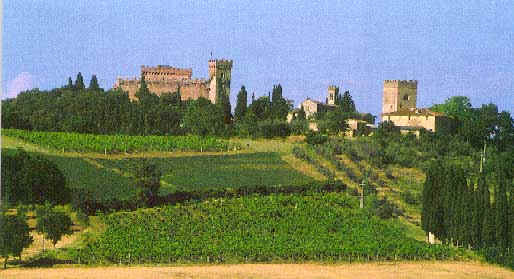 Poggibonsi is nowadays the biggest industrial area of the Valdelsa. 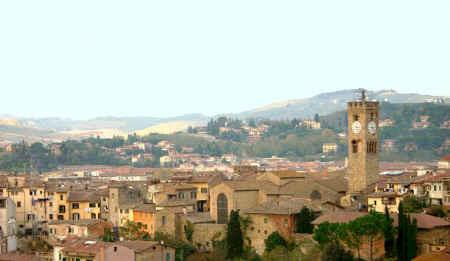 In the city centre we can find the two churches of San Lorenzo and the Choral, the Town Hall with the mayors' crests standing next to a battlemented tower. Sites of interest are the Fonte delle Fate (fairies' fountain) of the 13 C, by Balugano da Crema, with its beautiful ogival arches and the unfinished fortress, designed in 1478 by Giuliano da Sangallo at the request of Lorenzo the Magnificent. In the 14 C Convent of San Lucchese, first belonging to the Camaldolese order and then from 1213 to the Franciscans, there are frescoes of the 14 C and 16 C and a urn containing the remains of San Lucchese, patron of the town. Click here for holiday accommodations in Tuscany - villas, vacation apartments, Bed and Breakfast rooms, agriturismi with pool. Only the lower part of inner tower of the ancient castle of the Soarzi still stands today, together with two circular towers from the fortified palace of the Franzesi. The village still has a mediaeval look about it though there are very few architectural elements that actually date so far back in time. Six square towers and one polygonal tower are built at intervals around the curtain walls. The Florentine Gate and the Lecchi Gate opened at the north end of the village with the Roman Gate, destroyed in 1944, to the south. 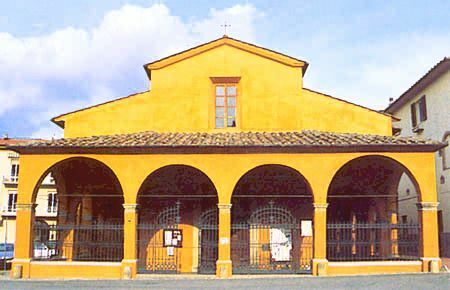 The Church of S. Maria, once a subordinate church of the parish of Marturi, can be found in the village itself. Its original design was Romanesque (perhaps 13th century), later modernized in 1878 and 1904, the year in which the bell tower and cusp were built. The church interior is in the form of a Latin cross. On the left, there is a baptismal font by the Staggia sculptor Cesare Capezzuoli, who also carried out the Via Crucis. The left hand wall contains panels in bronze of stories from the New Testament by sculptor Giulio Capezzuoli, again from Staggia. The two round windows that illuminate the chapels in the transept date from the 16th century while the beautiful grey stone ciborium is in pure Renaissance style. The presidential chair in travertine stone by architect Alessandro Bagnoli stands behind the high altar. The 15th century Church of the Misericordia is situated next door to the parish hall: the interior contains a fine 17th century polychrome crucifix in wood. On display in the museum next door we can find several important works of art, among them the splendid "The Holy Communion of St. Mary Magdalen, carried up to the sky by angels" by Antonio Pollaiolo; the artist was taken ill while he was working in San Gimignano and hospitalized at Staggia where he painted this picture of the Saint because of the widespread worship of St. Mary Magdalen among the local population. Vorresti pubblicizzare la tua attività su questo sito web per Poggibonsi e ricevere traffico in entrata dalla nostra rete di più di 50 portali relativi? Clicca qui per ulteriori dettagli in merito alla nostra soluzione integrata per una presenza su internet piena di successi. Poggibonsi © ammonet InfoTech 2000 - 2018. All rights reserved.